I was just perusing the online Apple Store ahead of a trip to the mall and ran across the Kinsa Smart Thermometer. 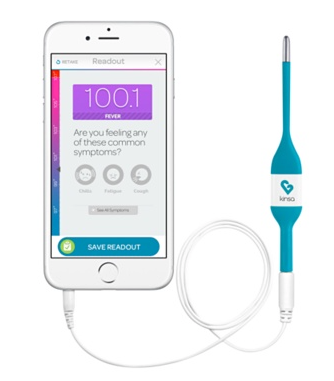 "The Kinsa Smart Thermometer neatly plugs into your iPhone, iPad, or iPod touch and takes rapid, 10-second temperature readings in conjunction with the Kinsa SmartHealth app. To make temperature taking as easy and enjoyable as possible, the app displays delightful screens that engage and calm your children." Kids around the world hoping to stay home from school by faking a fever are now saddened. The thermometer to the light bulb trick will no longer work. For more information, check out the Kinsa thermometer page at the online store.